Thanks for taking the time to share this pattern. I made one for a box my friend is putting together for a local hospital. Now I’m making one for an operation child box to fit a doll. Thanks for this. I’ve just downloaded the PDF. It looks great except for the very last St where you’ve forgotten the red/blue ! I’ll give this a try this week, and hopefully also the magic loop which has always fascinated me, and let you know how I get on. Best wishes Rosie. Nuts. I’ll fix that and add it again. 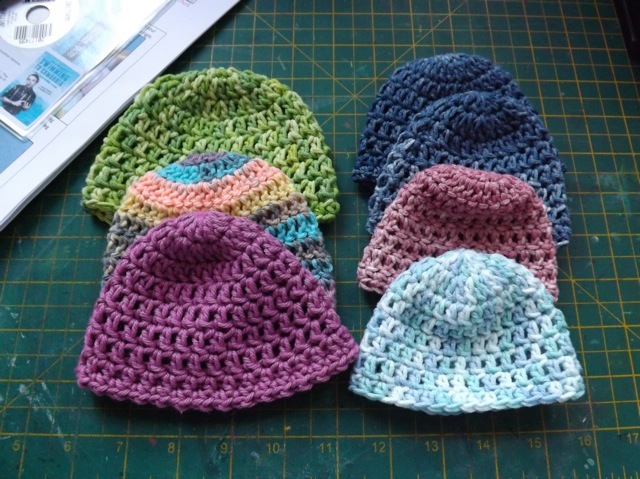 I also tried, and prefer, skipping the hdc/htr round on the ribbed edged hat …. silly not to have tried it first. Oh these look cute – I’ll have to try a few – such a great way to use up all those little ‘bits’ that are too small to use but too nice to throw out!